James I. of England, and VI. of Scotland, was the son ofMary Queen of Scots, by Henry Stuart, Lord Darnley, and was born June 19, 1566. In the following year Darnley was murdered, and Queen Mary being forced to resign the crown, James was solemnly crowned at Stirling, and all public acts ran in his name. Among the eminent scholars to whom the education of the young king was intrusted was the great historian and poet, George Buchanan. The Earl of Morton resigned the regency in 1578, but very soon had the chief power again in his hands, and retained it till the end of 1580. In 1582 the ‘Raid of Ruthven’ took place, and James was made captive by a party of the nobles. He regained his liberty in the following year. When it became apparent that the life of his mother was in danger he wrote to Queen Elizabeth, appealed to other courts for assistance, and assembled his nobles, who promised their support. The execution of Mary, however, took place; and though James prepared for hostilities, the inadequacy of his resources prevented him from engaging in actual war. In 1603, on the death of Elizabeth, James succeeded to the crown of England, and proceeded to London. Although he had behaved with great lenity to the Roman Catholics in Scotland, those in England were so disappointed in their expectations of favour, that, in the year after his accession, the Gunpowder Plot was devised by some of their most desperate adherents, to destroy the King, the Prince, and the Parliament. In 1606 James established episcopacy in Scotland. In 1612, Prince Henry, his son, by Anne of Denmark, died, and the same year his daughter, the Princess Elizabeth, was married to Frederick, the Elector-Palatine. One of the greatest blots upon the character of James I. was the execution of Sir Walter Raleigh. The close of the life of James was marked by violent contests with his parliament, the preliminary skirmishing of religious and political parties, which became civil war in the following reign. 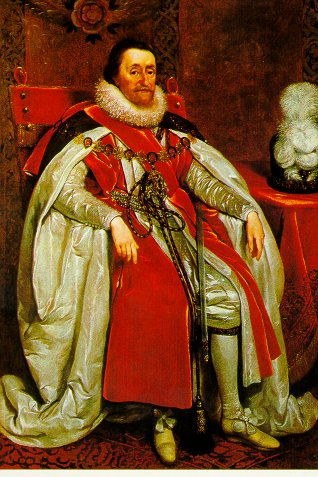 Although James I. had received a careful education, prided himself on being a patron of literature, and even wrote many works both in prose and verse, he was not merely destitute of the vigour and ability and wisdom of a great sovereign, but had neither the intellectual nor moral qualities which go to the making of a noble man. Feebleness, indolence, vulgarity in tastes and pursuits, vanity, pedantry, these are the prominent features of his character. We must not omit to mention, as one of the memorable events of this reign, the preparation of the authorized translation of the Bible. Died March 27, 1625, aged 58. There are two portraits of James I. in the National Portrait Gallery, one by Van Somer, the other probably by Zucchero. Another portrait by Van Somer is at Hampton Court.